Receive a morning pickup from your Barcelona hotel or apartment before continuing aboard a private vehicle with your private group as you head to Girona. While in transit your guide will share insights into the city’s rich history, which dates back to the Roman era. Spend time in Girona discovering some of its top ancient landmarks, including the Old Town, Girona Cathedral, and the Jewish Quarter, renowned as one of the best-preserved medieval Jewish areas in all of Europe. You’ll also get to admire Girona’s collection of bridges, one of which was built by famed architect Gustave Eiffel in 1877. Before leaving Girona, take some time soak up the town’s charming atmosphere as you stroll the narrow streets and sit down for a coffee break in an intimate public square. 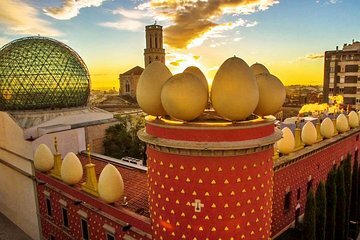 Continue your excursion in Figueres, best-known as the hometown famed artist Salvador Dalí. In Figueres you’ll get to visit the Dalí Museum (own expense), a showcase designed by the quirky creative inside a former municipal theater. Marvel at the eccentric artwork and surreal collections displayed in this fascinating institution dedicated to one of Spain’s most famous citizens. You’ll return back to Barcelona and get dropped off at your hotel or residence in the evening. We just took our tour of Girona and Figeueres with Miquel. He is an EXCELLENT guide! He's quite knowledgeable about both cities, as well as Barcelona. And he knows so much about Dali. The main reason we went on this tour was to see the Dali museum in Figueres and it did not disappoint. Miquel walked us through the whole museum and explained intricate details about the art and Dali's life, and clarifying how parts of Dali's interesting background influenced his his works. As it was a private tour, he customized it for us to spend more time in places we wanted to see, and less or no time in areas we did not care to see. We definitely recommend this tour ad Miquel. Thank you for making it a great experience! We enjoyed a day in Girona and Figueres with our private guide Elisabeth. Highlights included an extensive walking tour of Girona, a great lunch at a restaurant in Figueres, and a tour of the Dalí museum in Figueres. Elisabeth was friendly and informative and always eager to answer our questions. Great tour guide and fun day getting our of Barcelona and seeing 2 interesting sites. Vincente is a truly great guide. We had a private tour with his driver and headed out to the medieval town of Girona on a perfect spring morning. The spring landscapes of flowering trees, the sunny skies, the exceptional descriptions and interesting, often amusing facts made for a perfect day. We had ample time to wander and look closely at the Dali Museum, lots of time to have a lovely lunch in the town of Girona, as well as explore the Jewish Quarter and museum there. We loved it and would highly recommend this trip to all art lovers, history buffs as well as anyone who might like a great trip up through the rolling countryside. Excellent.